When you’re looking for HR innovation, a century-old fine jewelry maker might not be your first thought. But Van Cleef & Arpels prove that a company built on legacy can establish itself as an industry leader with a modern, technological approach to human resources. Van Cleef & Arpels opened its doors at 22 Place Vendôme, Paris, in 1906. Known for the poetry and exquisite craftsmanship of its jewelry and timepieces, it has evolved from a small family-run business to a multinational enterprise with 129 stores and 1000 employees worldwide. Recently, Van Cleef & Arpels started looking for ways to boost employee engagement and enhance team performance. They faced a delicate challenge: nurturing a dynamic, responsive workforce in an industry dominated by tradition. Director of Talent, Céline Gallet, was confident that digitization was the way forward. In 2017, the company turned to Zest for an innovative HR solution to build stronger teams. Since then, they have seen unexpected benefits. We started out using Zest’s Poll module to run quick surveys, to see what our employees thought of things like new training program ideas. We soon realized that the polls were generating valuable information we could feed back to our teams. So, we created ‘Key Zesters’ — coworkers who pass on the information from surveys for actionable results. Alongside Polls, Van Cleef & Arpels’ go-to modules are Projects and Ideas, which they use to achieve quick, effective communication, collaboration and alignment across the organization. Employees can request feedback on recent initiatives or share new ideas with coworkers in an open, informal context. 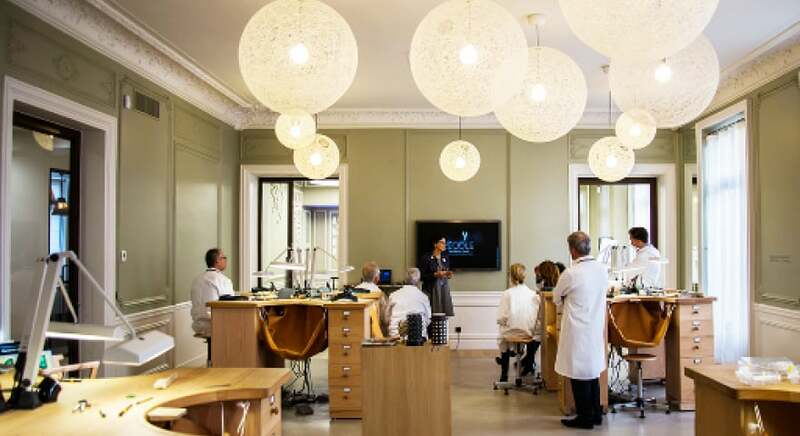 By putting HR at the heart of their mission, Zest gives Van Cleef & Arpels the capacity to improve engagement, not just between managers and employees but across departments and teams. Teamwork at the heart of jewellery craftsmanship at Van Cleef & Arpels. Today, more than 450 Van Cleef & Arpels employees use Zest in the company’s French and Swiss offices. With multiple ongoing projects in fields from marketing to fine metalwork, it’s essential that employees share the company’s mission and values at every level. They use modules like Feedback to check that employees have a clear sense of their goals at any given moment. Each year, Van Cleef & Arpels recruits around 60 new employees in its French locations alone. The company recently opened new locations in Germany, Canada, Japan and Korea while remaining strong in its traditional European market.